Today I’m going to cover a fairly serious topic that we as cat owners never want to think about. I don’t think I’ve talked about this much on the blog, but in the first year we had Walker my dad had left the front door open and Walker escaped. Everyone denied leaving the door open and at that time it truly didn’t matter who left the door open, what mattered was we needed to check the house for Walker. We spent about 10-minutes searching for him in his favourite spots and when we couldn’t find him it was time to look outside. Statistics aren’t the greatest for finding a lost cat, especially in the neighbourhood we were in. We walked around the block and couldn’t find Walker anywhere. It seemed like wherever he was, he didn’t want to be found. That being the case, Walker is usually a fairly talkative cat, so to have him not respond when we called his name was terrifying. Well, after a good amount of searching we went back inside, I was completely devastated and in tears. This is when the blame game started and we tried to figure out who had come into the house last and figure out how long Walker was potentially out there. Figuring out that it had been my father who came in and out last over an hour before my anxiety went through the roof. Was Walker okay? Did he run far? Did he get lost? Will he find his way home? Or worst of all… Did Walker get hit by a speeding car? My brother in law helped rally us back outside and almost immediately we saw Walker hiding in a bush right beside our house. I can’t tell you how relieved I was to see the little scamp! I called out “Walker” left the front door wide open and Walker went running into the house. I remember thinking to myself, “I’ve never seen a cat run so fast!” and it was the first time I saw Walker as being an animal instead of as just a “housecat” if that makes sense. Since I was a fairly new pet parent I didn’t have the greatest idea of what to do when your cat runs away other than… go searching for them and if you can’t find them put up posters. So since then I’ve done my research and thought I’d share it with you. 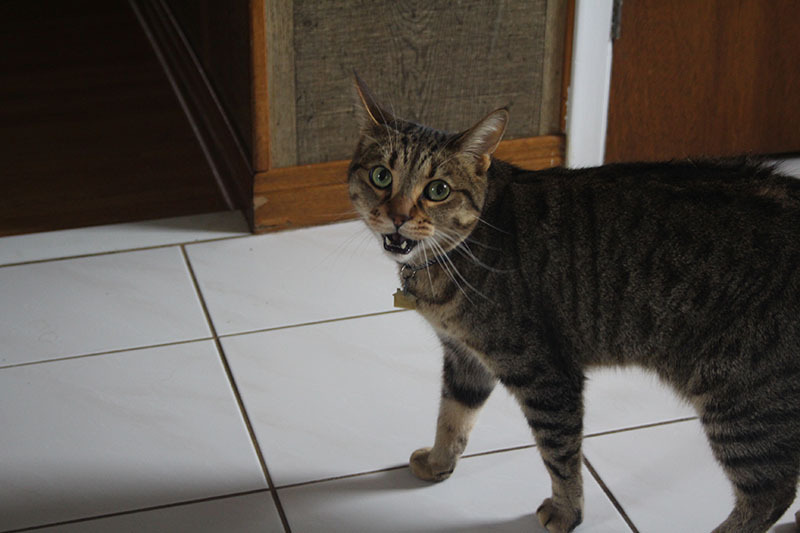 *Photo from Why Does My Cat Meow so Much? Is My Cat Sick? You may be worried that your cat has something wrong with them or that they are unhappy with you, however, this is not usually true. Cats, unlike dogs, actually run away due to some factors that are in their genetics. Cats are aware that there is a world outside of your front door. It’s for this reason that even cats who live in condos like to leave the front door. Cats will be curious as to where else they can get food if there are other cats in the neighbourhood or area and where the sun is the best so they can lounge about. This is primarily for those of you who do not have spayed or neutered pets. If your cat is in heat she may try to escape to find a mate. 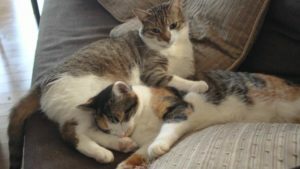 I would really encourage you to read this short article about cat heat if you are the owner of an unspayed cat. The same can be said about male cats, though they do not have a specific time where they’d be more inclined to mate. On that note, it is very important to spay or neuter your cats, not just so they aren’t mating with any ol’ cat, but because it drastically reduces the risk of them running away. It’s easy to forget the fact that your cat is built to be a hunter. Even though our cat Beau was a stray who used to bring my sister dead animals, his small teddy bear size always makes me forget how vicious he once was. 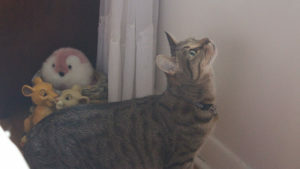 Cats may try to escape because they have the urge to hunt or chase other animals, especially if you have the windows open and they can hear birds. Cats will travel fairly far to find food, especially if they have a lot of pent up playful energy. 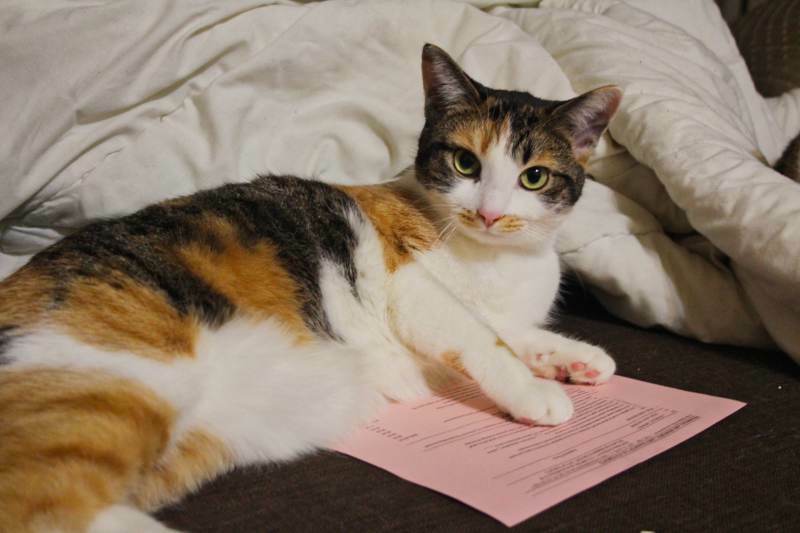 *Photo from Why Do Cats Lay on Paper? Does Everyone’s? If you recently moved your cat may be in search of their old home. 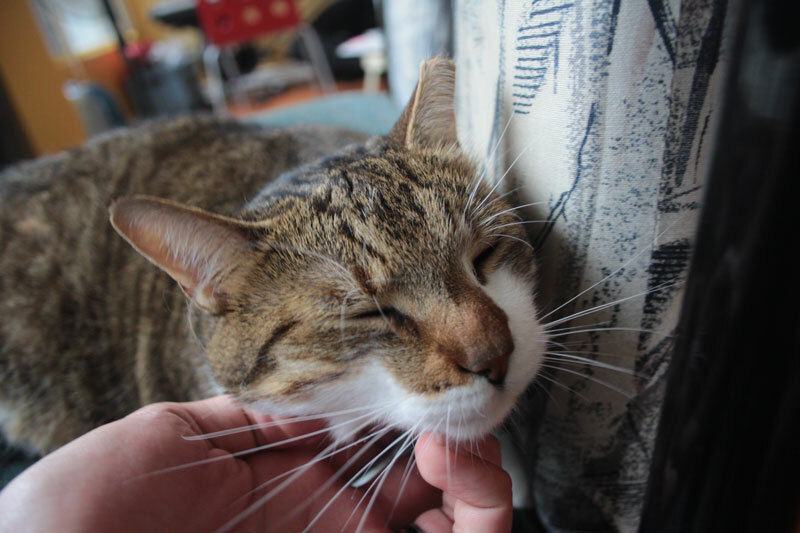 Due to the fact that cats are territorial, they feel safest in areas that they know well that smell like them, so it’s not out of the question for them to search for their old home. I hate that this is a reason for cats to run away, however, it is not unheard of. Many cats choose to be alone when they are sick or close to death so that they can get as much peace as possible. While it is true that most cats have no concept of death or illness, they do have a concept of pain and upset. This somewhat ties into the point above but also related to cats who have been abused. Cats who are unhappy with their homes will be more likely to want to escape. This being the case, it is best to try to your home as quiet and peaceful as you can. If you have small children, make sure you teach them to be gentle with your cat as roughhousing can traumatize a cat. Cats are much smaller than we are, so it is much easier for them to get scared. If you live in a house, make sure you check your back yard or front yard first. If your cat is a full-time housecat, chances are they didn’t go very far. Many cats hide under decks, inside of bushes, sheds and other shelters in the back or front yard. Leave food out for your cat and make sure to check on it often. If your cat smells the familiar scent of their kibble they may return within the day because they are hungry. 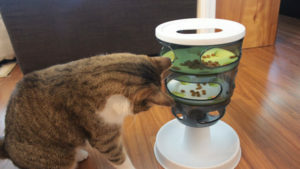 If your cat has been missing for an extended amount of time and the food keeps getting eaten it might be of interest to set up a webcam or baby monitor to ensure that it is your cat who is coming to eat the food. Alert pet stores, shelters, vets, and other animal-associated workplaces in your area just in case someone comes with your kitty. Ask local establishments if you can leave a flyer. You may also want to hand out flyers to your neighbours or at least let them know about your cat’s disappearance. Alert an Animal Control Officer so they are aware that your cat is on the loose. Post on Facebook, Twitter and other websites/social media. I would also recommend contacting pet blogs from your area. Make sure that you are microchipping your cat. We actually had an experience where a kitten snuck into our apartment and the first thing we did was check to see if she had a microchip. Unfortunately, she didn’t, which made it a bit harder to find her parents. Luckily, since she was in an apartment we knew she lived somewhere in the building, but if she was a kitty who snuck into our home and no one came looking for her/we didn’t see posters we would have adopted her immediately. We personally do not use collars in our household because Beau almost choked himself to death on one. Both of our cats, however, are microchipped. Collars and tags are great, however, can be hazardous. The good thing about breakaway collars though is the fact that your cat is safe from choking if they get snagged onto trees or other pointy objects. DO CATS KNOW WHERE HOME IS WHEN THEY’VE RUN AWAY? Cats are definitely intelligent and they are quick to learn their surroundings, however, if they are in “fight or flight mode” they may get lost or disoriented. This is especially true if your cat is not used to going outside or walking around the neighbourhood. Cats will try to retrace their steps by scenting or urinating along the way. WHEN SHOULD I GIVE UP HOPE? You shouldn’t, however, don’t rely on your cat coming home past 18 hours. If 18 hours have passed, it usually means that it’s 100% up to you to find your cat. Now, again, this will differ from cat to cat. For example, my cat Beau used to visit my sister every few weeks. He always knew where her house was, but he would only come when he needed some extra food or company. The same may be said about your cat. If they are being fed or taken care of elsewhere, they may not return. While it is terrifying to have a cat run out of your home, it doesn’t mean that they will never return. There are plenty of ways to help make sure that your cat returns safe and sound, however, it does take more prep work than you think. 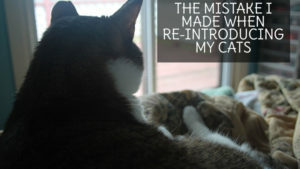 So, pet parents, I’m curious, what are some of the things you’ve done in case your cat escapes? Are there any pieces of advice you’d like to share that I haven’t mentioned? Let me know in the comments below! Do Cats Eat Roaches? Is it Safe For Cats to Hunt & Kill Cockroaches? My cat disappeared for 5 nights and 4 full days. He suddenly showed back up on my back yard patio. He seemed fine, didn’t appear to have any injuries. I thought about taking him to the vet but didn’t want to spend the money unnecessarily. A few days later I noticed he didn’t seem to be feeling good. I took him into the vet. She felt around on his haunches and found a very bad abscess where he had been bitten by another cat. I was so glad I finally took him to the vet but regretted not taking him sooner. Even if you don’t see any injuries it might be a good idea to have your cat checked out by a vet if he/she went missing for more than a few hours. Also I did register him on a missing pet web sight when he went missing. I can tell you I was never more happy than when I looked out my dining room window and saw him setting there on the patio. Thank goodness my Edgar is back home. I truly thought he was gone forever. Hey Elizabeth! Thank you so much for sharing your story. You’re absolutely right, sometimes we do miss things that the vet would catch. My family hasn’t micro-chipped or put a collar on Daisy Mae. She does have a flea collar but that’s it. Are there other options other than micro-chipping and collars? At the moment, not really. There are ways to tattoo your cat, which I personally have never done or seen. You can also register your cat on “Lost & Found” websites, however, it will depend on how many people are using that site. I know companies are trying to come up with new GPS trackers for cats as well as apps where people can report strays/cats they see walking around, however, the user base is extremely small making them virtually useless. I’m the biggest fan of microchipping, just because it’s been the easiest way for me to return lost cats and dogs to their owners (which has happened quite a bit over the years, especially working in the pet store), and I know some vets have one day a year where they will do it for as low as $5 (however, this will depend on the vet). We lost Chucky for about 1/2 a day years ago, and at first I walked for blocks around, calling him. 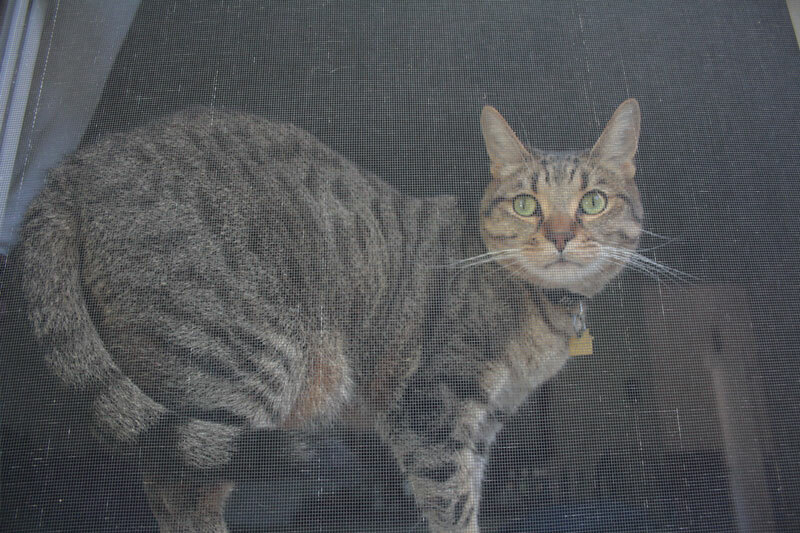 Then, I got back inside and did some web surfing, and realized that as an inside cat, he was probably very close. I sat down at the bottom of the driveway, and shook a treat bag and called his name, and left the front door propped open. Within 20 minutes, The Hubby called out that Chucky had just run inside! The cat can get really scared, and won’t move from his hiding place even when he hears his humans. In our case, Chuck came out once it was dark enough for him to feel that any predator couldn’t see him, and he left his hiding place.